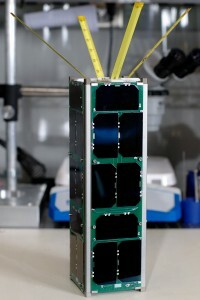 RAX is a standard 3U CubeSat that is 10 cm x 10 cm x 34 cm in size and 2.8 kg (~6 lbs) in mass. The satellite is designed to these dimensions so that it can fit inside the Cal Poly P-POD, a specialized container and deployment mechanism by engineers at Cal Poly San Luis Obispo that many launch providers are able to attach as secondary payloads to their launch vehicles. Its primary mission objective is to study large plasma formations in the ionosphere, the highest region of our atmosphere. These plasma instabilities are known to spawn magnetic field-aligned irregularities (FAI), or dense plasma clouds known to disrupt communication between Earth and orbiting spacecraft. The RAX mission will use a network of existing ground radars that will scatter signals off the FAI to be measured by a receiver on the RAX spacecraft. The spacecraft will measure “radio aurora”, or the Bragg scattering from FAI that are illuminated with a narrow beam incoherent scatter radar (ISR) on the ground. This remote sensing method is based on the powerful mathematical relation that the radio aurora intensity is proportional to the irregularity k-spectrum evaluated at the Bragg wave number. Amateur radio ground stations can volunteered to track RAX throughout her mission. These stations will be receiving telemetry transmissions from the spacecraft and forwarding them to our database. Are you an amateur radio operator who’s interested in helping us track RAX? Click here for more information! RAX-2 stopped transmitting beacons over the weekend and is not responsive to normal commands. The cease in normal operations happened mid-day on Saturday, April 20, and the cause of the issue is currently under investigation. We will be recording the spectrum during passes and sending up some custom commands in an attempt to determine the cause. RAX-2 has been operating on-orbit for 540 days, has completed its scientific goals, and has surpassed it’s planned one-year scientific mission. Launched and active. RAX-2 is scheduled to launch on 28 October 2011 from Vandenberg Air Force Base in California. 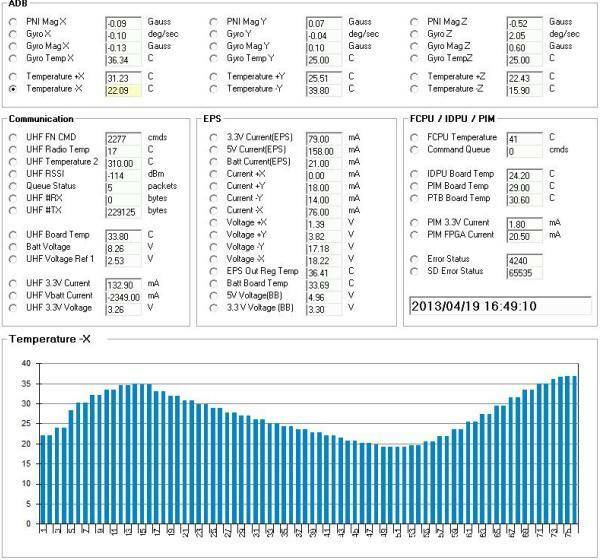 One of the latest telemetry in the below image.